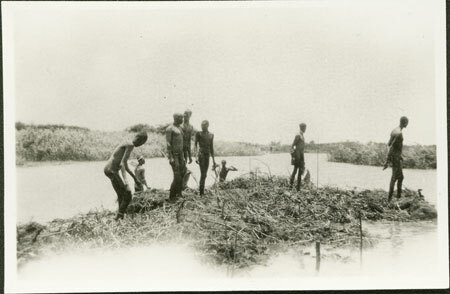 A group of men standing on a floating bed of vegetation in a river known as sudd (from Arabic sadda, to obstruct). They may be clearing this vegetation from the river, in order to prevent it blocking the river and flooding nearby grazing land or camping ground. Note on print reverse ms pencil - "16 117 64 "
Morton, Chris. "Nuer men clearing sudd" Southern Sudan Project (in development). 03 Jan. 2006. Pitt Rivers Museum. <http://southernsudan.prm.ox.ac.uk/details/1998.346.64.2/>.